Hale McKissack was born April 21, 1904 in Runnels, Texas, to William Wood McKissack and Sarah Margaret Clara Gassiot. He lived in Runnels, Texas all his life until he enlisted in the U.S. Navy at Dallas, Texas, February 19, 1941. He then reported to San Diego, California for basic training, after which he served a short time aboard the troop carrier U.S.S. Wharton (AP-7). 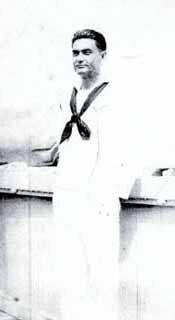 In August of 1941 he was transferred to the battleship USS Oklahoma (BB-37) and was aboard when the ship was torpedoed at Pearl Harbor, Hawaii, December 7, 1941. It is not known whether he was killed in the attack itself, or trapped below decks when the Oklahoma capsized. Of the bodies recovered from the wreckage some months later, few were identified and most were placed in mass graves on Oahu. In a notice that appeared in the Abilene Reporter News (Texas), May 8, 1945, he is named as the first World War II casualty from the county. Note that he remained listed as “missing” by the navy for over three years, since his remains were never positively identifed. We are related to Hale McKissack through Paul N. Lucas. One Family Search pedigree has Hale adopted by Rachael Guinn and William B. Adams (Rachael Guinn was Mary McKissack’s daughter), but this doesn’t make much sense since William B. Adams died before Hale was born and Rachel Guinn was born in 1836 and would have been 68 when Hale was born. WFI Research Group listing McKissack as one of the Oklahoma missing, buried in mass unknown graves in “the punch bowl” on Oahu.